Below the four parts have been reorganized. The four partitions are exactly the same in both arrangements. Why is there a hole? Where does this hole come from? Hint: This is not an optical illusion. If you print out the puzzle, cut out the pieces and rearrange them, you get the exact same dilemma. 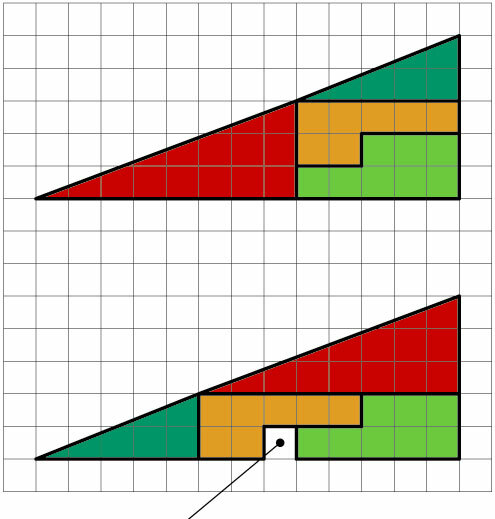 Solution: The gradient of the teal hypotenuse is different than the gradient of the red hypotenuse. You have a three gallon and a five gallon measuring device. You wish to measure out four gallons. Solution: Fill the five gallon container. Pour all but two gallons into the three gallon container. Empty the three gallon container. Put the two remaining gallons from the five gallon container into the three gallon container. Fill the five gallon container one more time. Pour one gallon from the five gallon container by filling the three gallon container. Now the five gallon container contains four gallons. There are two beautiful yet remote islands in the south pacific. The Islanders born on one island always tell the truth, and the Islanders from the other island always lie. You are on one of the islands, and meet three Islanders. You ask the first which island they are from in the most appropriate Polynesian tongue, and he indicates that the other two Islanders are from the same Island. You ask the second Islander the same question, and he also indicates that the other two Islanders are from the same island. Can you guess what the third Islander will answer to the same question? Solution: Yes, the third Islander will say the other two Islanders are from the same island. You are mixing cement and the recipe calls for five gallons of water. You have a garden hose giving you all the water you need. The problem is that you only have a four gallon bucket and a seven gallon bucket and nether has graduation marks. Find a method to measure five gallons. Solution: Pour the four gallon bucket filled with water into the empty seven gallon bucket. Fill the four gallon bucket up again and poor as much as you can into the seven gallon bucket until the seven gallon bucket is fill. Now there is one gallon left in the four gallon bucket. Empty the seven gallon bucket and transfer the one gallon of water into the seven gallon bucket. Fill the four gallon bucket one more time, then pour the four gallons into the seven gallon bucket making which already has one gallon in it, making a total of five gallons. You have two strings whose only known property is that when you light one end of either string it takes exactly one hour to burn. The rate at which the strings will burn is completely random and each string is different. How do you measure 45 minutes? Hint: Don't burn your candles at both ends trying to solve this one. Solution: Light both the ends of the first string and one end of the second string. 30 minutes will have passed when the first string is fully burned, which means 30 minutes have burned off the second string. Light the end of the second string and when it is fully burned, 45 minutes will have passed. Some people have difficulty grasping that when you light both ends of the first fuse, it will take 30 minutes to burn. Because the burning rate is random and unknown to you, you have no idea where the 30 minute mark is on the fuse. If you had an exact duplicate, then the 30 minute mark would be in the same place. It is probably not in the middle, but it is somewhere. If you burn both ends of a fuse it will not stop burning until it has reached this mark, which means 30 minutes is up. A corporate businessman has two cubes on his office desk. Every day he arranges both cubes so that the front faces show the current day of the month. What numbers are on the faces of the cubes to allow this? Note: You can't represent the day "7" with a single cube with a side that says 7 on it. You have to use both cubes all the time. So the 7th day would be "07". Hint: 1 & 2 must be on both cubes (11 & 22). So must one other number. 6=9 upside down. The 6 doubles as a 9 when turned the other way around. There is no day 00, but you still need the 0 on both cubes in order to make all the numbers between 01 and 09. Alternate solutions are also possible e.g. A pot contains 75 white beans and 150 black ones. Next to the pot is a large pile of black beans. A somewhat demented cook removes the beans from the pot, one at a time, according to the following strange rule: He removes two beans from the pot at random. If at least one of the beans is black, he places it on the bean-pile and drops the other bean, no matter what color, back in the pot. If both beans are white, on the other hand, he discards both of them and removes one black bean from the pile and drops it in the pot. At each turn of this procedure, the pot has one less bean in it. Eventually, just one bean is left in the pot. What color is it? Solution: White. The cook only ever removes the white beans two at a time, and there are an odd number of them. When the cook gets to the last white bean, and picks it up along with a black bean, the white one always goes back into the pot. Hint: You must presume that the pigeon can go from 0 to 18 mph instantaneously, plus also turn around instantaneously. There is a lightbulb (incandescent, it's currently off) in an upstairs room. You are downstairs, standing next to a panel of three light switches (all of them in the off position). One of them controls the lightbulb. The other two don't do anything. You must figure out which switch controls the bulb, with some restrictions. 1) You can do whatever you want to the lightswitches, as long as it's either turning them on or turning them off. 3) You cannot see the bulb nor any light shining from it from where you're initially standing. 5) The lamp is in the ceiling and you don't have a ladder. Solution: Flick Switch A. Leave it on for ten minutes. Turn it off. Flick Switch B. Leave it on. Leave Switch C off. Go up to the room. If the bulb is off but warm, it is Switch A. If the bulb is on, it is Switch B. If it is off, and cold, it is C.